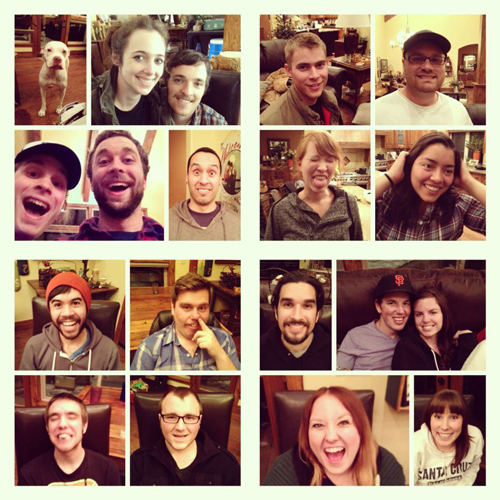 A couple of weeks ago, Robbie and I spent the weekend with friends in Shaver, CA. 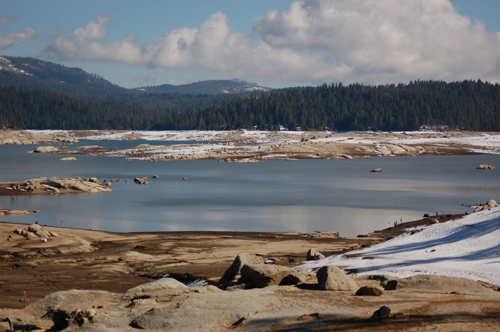 Shaver is a tiny mountain town with small shops, friendly people, and beautiful scenery. Our friend Alison's parents have a house in the area, and are generous enough to let us stay there. We have gone a few times before and have had a great experience each time. Since it was a short weekend, we wanted to squeeze as much in as possible, including naps and relaxation, of course! The weather was unseasonably warm and the sun was out. Fortunately, there was some snow on the ground so we were able to embrace wintery fun. After breakfast on Saturday morning, we walked to a nearby pond where the top layer was frozen. 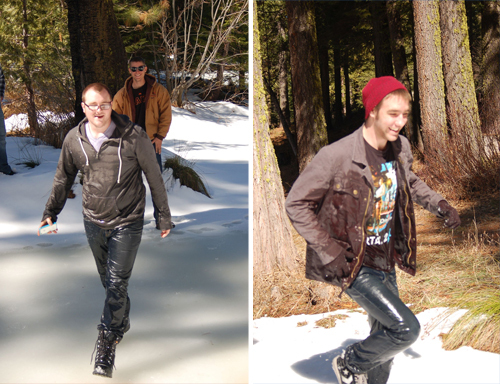 Caught up in the spirit (or boys just being boys) some of our friends decided to walk out onto the frozen pond. I was a bit apprehensive at first, but was surprisingly relaxed about their decision. I figured they would be extra careful, the pond is actual quite small, and there were enough "outdoorsy" types amongst us that they would know what to do in case someone fell in. Apparently, they noticed a log stuck under the ice. This log peaked their interest, so they went over to said log and decided to jump on it at the same time. Yes, they jumped on the ice of a frozen pond on a warm, sunny morning. I wasn't paying attention to them, but the very next thing I heard was the gasps from our friends who were watching. Right as they jumped onto the ice, they fell straight in! Before I could even grasp what had happened, they had already pulled themselves from the pond and were running to solid ground. After this little hiccup, I thought we had learned our lesson about testing the ice. But sure enough, as we headed to the other side of the pond, a new set of boys found a small raft and began breaking ice with it. As I stood there watching (and shaking my head), some other members of our party were throwing rocks and sticks onto the center of the pond seeing if they could break through. Right as someone threw a stick into the center of the ice, our dog Zoey came running through the crowd and straight onto the ice. As soon as she reached the center of the pond (and the stick of interest), she stopped to look back at everyone calling her name. As soon as she stopped, the ice cracked and she fell in! At this point, everyone around started screaming her name. I had no idea what was going on until I heard them screaming her name at the top of their lungs. I looked up and saw my dog struggling to claw herself out of the cold water onto the surface. Without missing a beat, I ran over to the edge of the pond. All I can remember about that moment is hearing my pulse in my ears and feeling my throat tighten. Tears had welled up in my eyes before I realized Robbie was taking his shoes off, planning on going in after her. 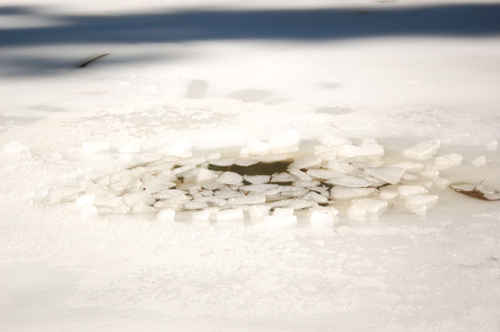 As soon as he lowered himself into the icy water, she was able to spring herself to safety. Although Robbie wishes she could have pulled herself out a few seconds earlier, we were all thrilled she was safe. 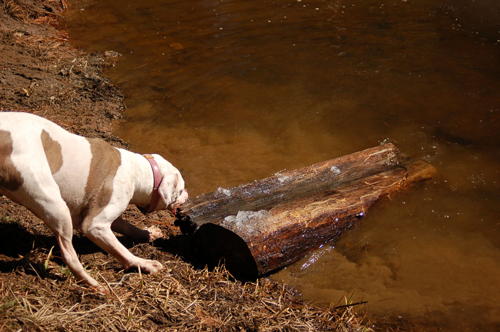 Zoey loves logs and sticks! The weekend became exponentially less dramatic after our trek to the pond. We enjoyed some lunch, then I headed out with our friend, Joel, for an off-roading adventure. We explored our surrounding terrain, found a beautifully serene lake, a hidden power plant, and drove along snow covered roads. Joel and I are equally content with silence, so experiencing nature away from the noise of my day-to-day routine was very peaceful and refreshing. That night, we held a "talent show" where everyone took part and participated in different ways. People sang songs, told jokes, and one person even lead a drum circle. It was so much fun to see the different talents people brought forth. The rest of the weekend was spent hanging with friends and enjoying our surroundings. We watched movies, went on a waterless hike Sunday morning, and I was able to enjoy reading my book. All in all, it was a great weekend spent with wonderful friends. I very much enjoy spontaneous conversations, eating meals together, and developing our friendships. I look forward to our next trip to the cabin! Do you take any annual trips with friends? Where do you go? that sounds so fun! beautiful pictures and CRAZY story about zoey!